The meet-up in Austin TX is on at 7:00 pm, Friday Aug 6. Are you going? Or will you wait until the last minute to decide? Why wait until the last minute? Just say yes. We need to know how big a table to get. So far three people said they would take a chance and do something different. They will be there. Will you? This is a follow on to the previous question: How about meeting a Jelly on Fri Aug 6 in Austin TX? That post was inspired by this question 5 days ago. Have you ever used Rentafriend.com? I was surprised at the large positive response I got after I posted the first question. Some very distinguished ladies liked the idea and said they would attend if they lived in the area. Now it’s your turn. Someone suggested that you should have a picture of the Fluther Jelly, (Dr J.? ), with you. Maybe @mrentropy or @Austin lad could print out one and have it on the table. Don’t be shy. Since all attendees have more than 1000 lurve and are over 21, you already know each other and have enough in common to have interesting discussions. There is even a small geocache hidden within walking distance nearby if you want to go outside and try to find it. Most likely I have already won the bet that someone would show I am hereby officially extending to saying a female will show and will donate the winnings so he will pay for the meal. Don’t stay in tomorrow night. Be a pioneer. Plan on a nice, light, 7pm dinner with good conversation. Don’t be worried, guy. I’ll be there! OK, here’s the deal. I actually checked out the possibility! Got my Fluther Green Card (Thanks Jeruba and Worriedguy). Here’s what I discovered: Travel costs… between$1000 and $1500. gasp. Travel time..15 to 20 hours. Gasp, gasp. The kennel is full and can’t board my dog and my daughter is out of town. Dealbreaker. I’ve been known in the past to do wildly impulsive things, and came really close, here, but I’ll be there in spirit examining the coffee cups. Have a wonderful time, guys, take pictures, be prepared to be overwhelmed with curiosity. Make stuff up if you have to. This whole type of thing is what Katawagrey has been telling me about and what finally convinced me to become a Jelly. Again, Kudos to @worriedguy for setting this in motion! Thanks for trying, @JilltheTooth. We’ll “toast” you. I’ve been following this – kudos. I shall be there in spirit, but alas, many thousands of miles away. My heart’s a-fluther with anticipation! I’m sure I’ll be there. The way my cars GPS is going I may get lost. Last time I searched for the place it wanted me to go to Camden, NJ. @JilltheTooth Just gotta ask: why the moniker? I can tell you right now that I’m not. @bob_ What – you don’t think there are good sandwiches in Austin? @janbb It’s more that I think that I have to work. If I made it over from the UK, would that automatically upgrade me to 1000+ lurve??? Seriously, have a good one! I’m too far away. If I lived close by, I would go. We need a poll of people and what areas they’re in. @Austinlad OK, I won’t worry. Have fun in Austin,Lad. Geez I’m all excited about this – and I’m not going. I will be there in spirit. @JilltheToothm I live for grins and groans! @Austinlad : Stick with me, kid, you’ll live forever! If you take pictures, be sure to include the laptop. It’ll be 7pm central time. Give or take a few minutes. I’ll be there in spirit. Too far away from MI in RL. Please try to make any pics or feeds iPhone compatible for the much neglected minority of us who choose to use the dang thing. I would love to, I lived in Austin for about seven years, it’s a great town and I really miss it, but alas, too far away, and too short notice. Have fun though. 7:00 p.m. in Austin is 5:00 in San Francisco (PDT) and 8:00 in New York (EDT). And, for good measure, it’s 1.00 a.m. on Saturday the 7th in London and 3.00 a.m. on Saturday the 7th in Jerusalem. The Magic Laundry Basket says I will be wearing a gray and white striped long sleeve (probably rolled up) button up shirt, jeans, and the cat harassed black sneakers. @JilltheTooth They’re really only savaged on the inside. What goes through that cats mind is a total mystery to me. Aside from his cat food? Just about anything. I’ve seen him steal a corn chip from my plate and eat it. He’s had several of those. In fact, he tries to sample just about anything I have on my plate. He’s about as bad as the cockatoo. This cat will just lay on the floor in the kitchen, right under my feet. He’s gonna get squished one day. Evidently FB won’t allow us to see it. Do you need to enable something or other? That’s why I’m not overly fond of them. About 90% of FB links I click on from various people behave similarly. Argh. @Buttonstc : I saw it, maybe your connection is wonky or something. And that is the sum total of my computer expertise. Well I’m on iPhone but that shouldn’t really make a difference. @Coloma Thanks, but nah. I’m covered in that department. Literally. @Austinlad It was really my cat savaged sneakers that made you change your mind, wasn’t it? If not, I hope the family emergency smooths itself out and becomes OK.
So… Should I go anyway? Or go home and go to bed? I think you should go, and take along a picture of Dr. J that you can place casually on your table for purposes of recognition. It might lead to an interesting conversation with a stranger. Since the point of this was, in a way, to get my buttocks out somewhere for some amount of time, I have been convinced to go ahead anyway. At the very least, I don’t have to cook dinner tonight. So, if there are any lurkers who haven’t said anything about going or not (how many Austinites are there?) I’ll still be there for a while. And I do have a DrJ with me. @mrentropy : And hey, if you take your laptop netbook, phone, whatever you can still report on the coffee cups. I seem to really care about those damned coffee cups! @Austinlad : Maybe next time you guys can get together and not have to have thousands of jellies vicariously along! Except, of course, for me, I insist on knowing EVERYTHING! You should go ! My money is riding on this!!! Maybe a lurker will show. Isn’t anyone willing to stretch, even a little, outside of their comfort zone? Well, here I am. It’s not very busy, I’m guessing because they don’t serve alcohol. I’m eating a Chicken Chipotle sandwich, which is pretty good. It’s got some heat to it. I also have potato chips and a coffee. Hazelnut. I already ate the pickle. @JilltheTooth The coffee cups are disposable paper ones so they don’t have a bunch of old coffee junk on them. The coffee is all right. I’m weaning myself off sugar, so it’s a bit bitter. @worriedguy I’m afraid you may be out $10. Some woman just walked up saying, “Hey, hey” but she wasn’t looking for me. The people next to me. I think she was looking for you! Then she’s very, very shy! Like all the rest of the lurkers. @JilltheTooth I’m sure the cups are sterile, though. That’s a plus. I think @Austinlad may end up getting together at some point. Maybe if we meet up and survive other people will feel encouraged to drop by. I just still don’t know how many people on Fluther are actually in Austin. JohnPowell’s map shows only you, so far, but it’s young yet. Seems to me like you guys need to do some road trippin’. @JilltheTooth Yeah, that needs time to grow. But, for all I know, it may just be me and @Austinlad in this burgh. Actually, I had wanted to drive up north to some towns that I used to have relatives in. Judging by Google’s streetview, they haven’t changed in the last 30 years or so. @JilltheTooth, wasted??? You acquired at least 250 points just on the strength of some great begging. Ever gone in for fund-raising? @mrentropy, I’m glad you’re there. I mean not just there but “there.” You’re brave. That’s always a good thing. Keep it up and the magic will happen. I’m sure there are others in your area. It seems to me that we have a lot of Texans showing up when certain questions arise. Some of them must be in Austin. @Jeruba That really was the deciding factor. There’s really no reason for me not to be here. The birds and cats will survive for a few hours without me. So, despite just wanting to run home to my cave I decided to go ahead and stay. But, you know, I’m not alone because you folks are here. @Jeruba : You’re right, not at all wasted :-). Long ago I did some fund raising, I was pretty good at it. But only for stuff I believed in. @mrentropy : Actually, you’re not really alone when you’re having conversations. And, BTW, New Jersey never changes. It’s an absolute in and of itself. So, when I was a kid we lived in Wharton, NJ and my grandparents lived in Clifton. Every Sunday or other Sunday we’d drive through Parsippany on Rt. 46 to get to Clifton and back. I remember what it looked like then: fields. Lots of fields, and a Snow Goose vegetable stand. When we moved to Parsippany, it was highways and hotels. Oh, there used to be a drive-in theater there, too. @mrentropy : I grew up in Englewood and it’s still pretty much the same, down to the old diner where there were booths, burgers and an honest-to God soda jerk. Well, the place is now owned by Koreans and has a heavy Greek theme to the menu, but the soda fountain is still there! @mrentropy : What were you doing in the Cliffs? I used to work for Bestfoods and there right next door to Lipton. 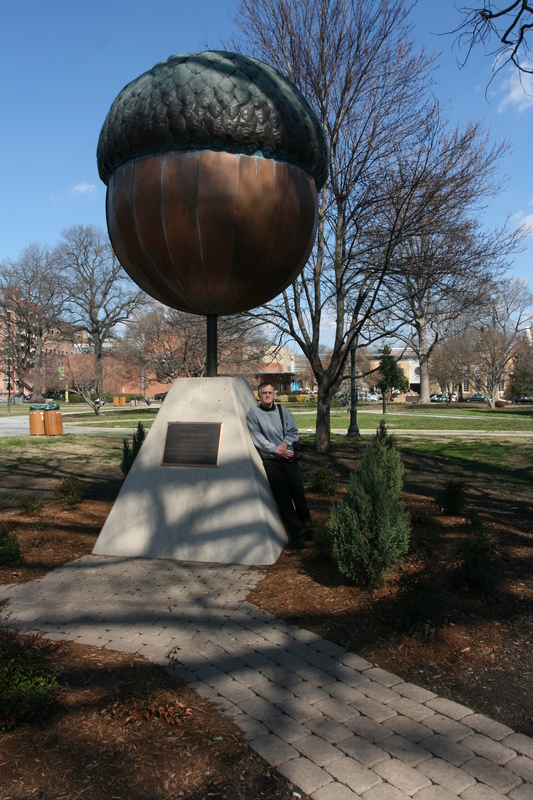 And remember, @worriedguy, even this big fella started from a single tiny acorn. @Coloma I’m tempted to drive over there. @Jeruba I so want to drive my car from NYC to California. Darn right. I ain’t eatin’ no ugly sammich. Well, the sandwich is gone and my coffee is nearly out. I reckon it may be time to move on. @JilltheTooth I only have a cell phone. And only Zoey the parrot would be able to answer the phone, and I don’t think she would. I do that sometimes. I get that. But only when I’m wearing feathers. I love Zoey. She’s a sweetheart, but very demanding. No, Zoey is the gray parrot. Tooka is the white cockatoo. He’s a nut. Jingles is the black & white cat, Junior is the brownish.. siamese? looking cat. Those are my only children now. You just proved you are the only brave one of the bunch. Nice. Loved the chat! Glad you got out. Hi to all your critters! Man, this was a bummer. I’m so sorry that I missed it. I’ll volunteer for the next round. I’ve got a place, just not a time or a date. I’ll sit at the Bouldin coffee house on South First street. They’ve got food, coffee, beer, and a good vibe. Even if nobody shows up, it would be a cool place to chill out for an hour. @silverfly I’m sure. Justa matter of when. I was thinking this coming Friday at the same time (7pm)... It’s Friday, the 13th – I’ll dress as Freddy. Ahh, but do they have good WiFi? @worriedguy Good question. I’m not sure. Most coffee houses do, but there is a possibility that it doesn’t. Why? So that one of you can bring along a laptop or Internet-enabled smartphone and keep all us nosy well-wishers updated. I’m sure there will be plenty of us folks living too far away who would like to “be with” you there in spirit. @Buttonstc I rarely differ with you but I think there is something to be said for letting the real participants have their RL meeting without an audience and someone giving us a report after the fact. I was basically just answering his Q of why wireless and admittedly making an assumption. The coffee house idea is out for me this Friday. The Big Boss will be going home soon and there’s talk of doing an office dinner. @mrentropy No problem. I wasn’t officially planning on being there. I’ll post a final thread once I’ve picked a date. My birthday is coming up and I have family coming in so it might be a couple weeks. Is having a “come with guy” rude? Shy people, when you meet someone new, what would make it easiest to feel comfortable talking to them? 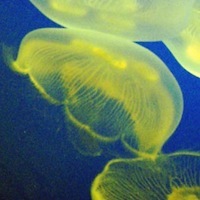 How about meeting a Jelly on Fri, Aug 6, 7:00 PM Austin TX area? What would be a good idea for a "hook" for an English paper?